The European Commission has cut down on the estimated GDP growth in the Eurozone. However, the Portuguese economy seems to be going against the tide. In the three years for which there are economic projections – 2018 to 2020 – the Portuguese GDP is expected to grow at a pace above its Eurozone counterparts, to which 75% of national exports are destined. 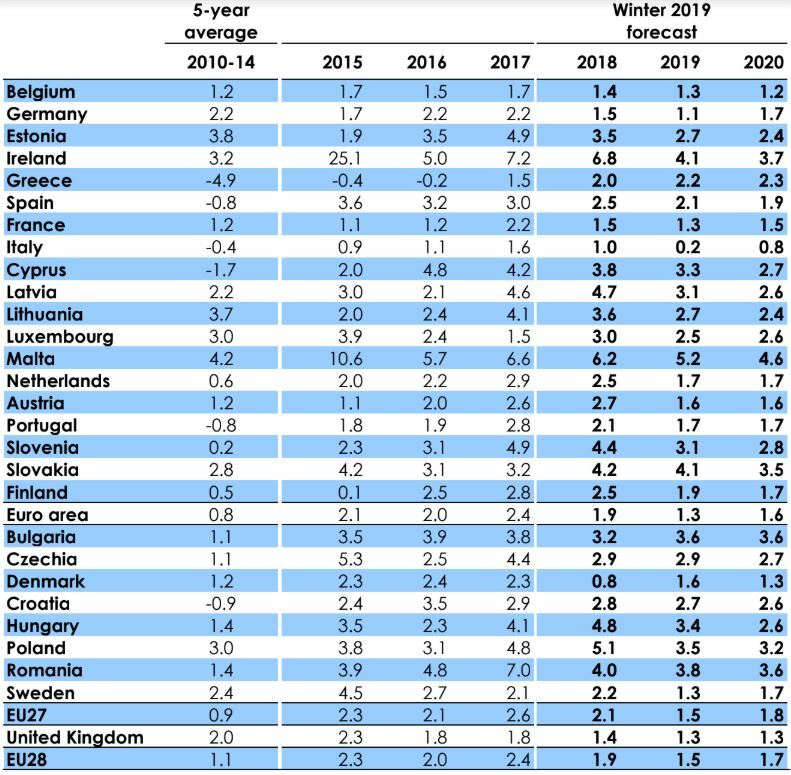 In the whole of the EA19, GDP is expected to grow by 1.9% in 2018, 1.3% in 2019 and 1.6% in 2020, according to the estimates on the EC’s Winter Economic Forecast, published this Thursday by the EU’s executive body. In November, Brussels had announced it expected GDP growth at EA19 level to stand at 2.1%, 1.9% and 1.%, in each of those years. This means that the European Commission is much more pessimistic about GDP growth, for all the years to come. However, this setback has not affected Portugal in the same way as it has affected other EA countries. Portuguese GDP was expected to grow by 2.1% in 2018 (two decimal points above the eurozone average), 1.7% in 2019 (four decimal points above eurozone’s average), and 1.7% in 2020 (again, one decimal point above eurozone’s GDP growth). This means that Portugal hasn’t dodged the EC’s downward revision of GDP growth for the Winter 2019 forecast, but still manages to keep a performance which is better than that of its commercial partners. In the Commission’s Autumn forecast, Portugal’s GDP was expected to grow by 1.8%, while the euro zone’s GDP was estimated to grow by 1.9% — and now, the situation has reversed. In the report which accompanies the Winter forecast, the Commission’s experts explain that the economic performance in the European Union slowed down due to “fading support from the external environment, as increased uncertainty regarding trade policies, notably between the US and China, and a declining trend in global manufacturing output translated into weaker global trade growth”, with the euro area being “particularly impacted given the geographical orientation of its external trade and its product specialisation”. The EC noted that some specific domestic issues have influenced and helped motivate the “loss of growth momentum”, including the disruption of car production in the third quarter, social tensions and fiscal policy uncertainties in some member states.